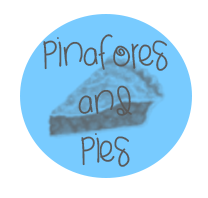 Thanks so much for supporting this blog! Please come and follow my blog on www.aliceinalookingglass.com where I’ll be continuing to blog all things beauty, fashion and life! Benefit Lollitint Cheek and Lip Stain. With Panatone naming Orchid as their Colour of the Year 2014, Benefit Cosmetics have cleverly taken the purple-pink hue and incorporated it into their range of lip and cheek stains. Lollitint, launched in UK stores today is a candy-orchid tinted lip and cheek stain and offers a fresh take on Benefit’s existing stains trio of Benetint, Chachatint and Posietint. 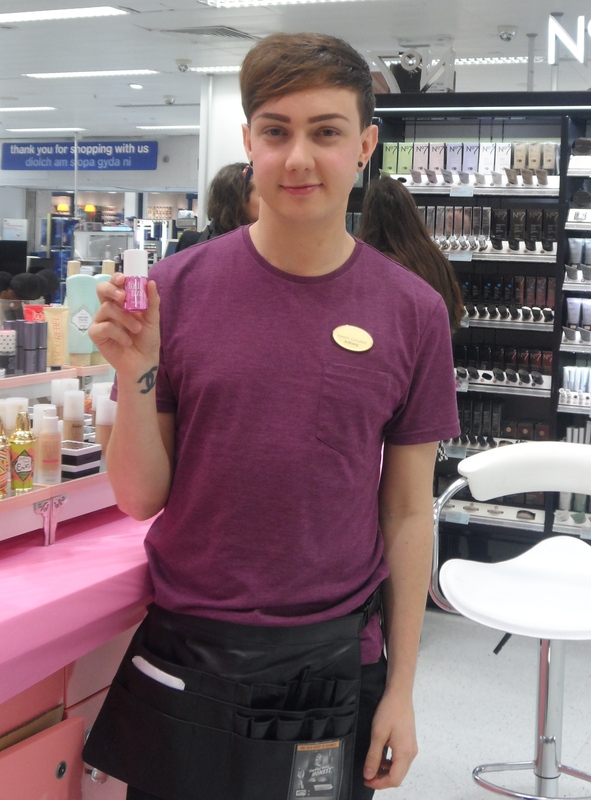 The very helpful Anthony at the Lollitint Launch at Benefit, Queen’s Street Cardiff. It’s a beautiful and unusual lilac colour and is certainly something different to brighten up every make-up lovers January! As I only purchased this product at its launch today (25/01/2014), I can’t offer a full, in-depth review so I’m just going to give my first impressions of using Lollitint. One of Benefit’s real selling points is its colourful and unique packaging and Lollitint is no exception. The vibrant pink box and stunning pink chrome bottle add to the product’s luxurious and on-trend feel and makes this a must-have product for girlie girls like myself. The application seems quite easy and there’s no need for brushes as you simply brush the product onto each cheek with three strokes and then blend it into your skin quickly with your fingertips. However, you do need to make sure you blend it immediately as being a stain, the colour sets very fast and can cause streaks if it’s not blended properly. 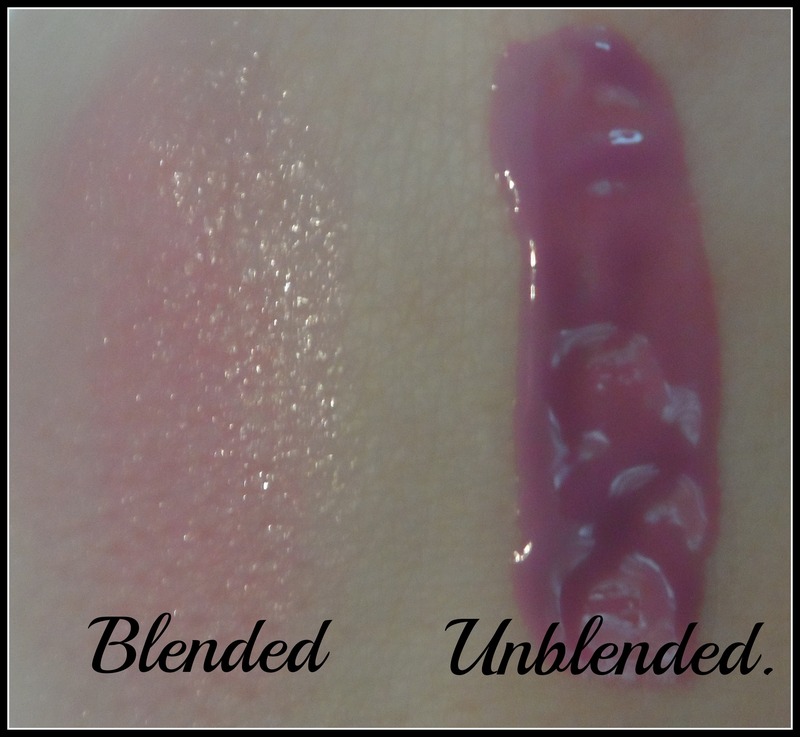 The bright colour does look a little scary in the bottle, but on the cheeks it gives a gorgeous pop of colour. It’s also an easily buildable shade so you can choose to create a subtle or a more intense look. 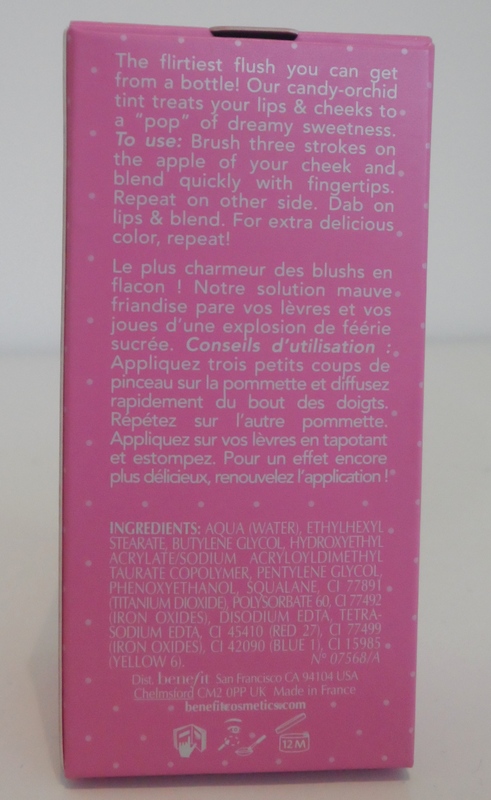 The stain formula also means it should last you all day and many hours on it still hasn’t moved from my cheeks. In fact, after I swatched Lollitint for this review, I really struggled to even remove the colour from my hand with make-up remover! I particularly love the colour on my lips as it’s pretty but striking and is very smudge proof. I do think it’s brighter and more noticeable on the lips than the cheeks. It’s also really easy to apply as you simply swipe it on your lips and blend it in, using more or less product depending on how bright you want the colour to be. It would be the perfect colour for a night out where staying power is particularly important! It does seem to have a bit of a drying effect but using lipbalm before applying Lollitint should solve this. Finished Look With Lollitint On Cheeks and Lips. Lollitint retails at £24.50, which isn’t the cheapest considering you only get 12.5ml of product, but a little does go a long way. It’s long-lasting formula also means you won’t need to be constantly applying more product throughout your day. Overall, I love the eye-catching colour of Lollitint and I think this will be my new go to colour both for the daytime and nights out! What’s your favourite Benefit product? Are you going to try Lollitint? With 2014 in full swing, many of our New Year’s Resolutions will have involved eating healthily and hopefully dropping a few pounds along the way. A delicious and convenient way to detox your system and get your five a day is through a juice cleanse. 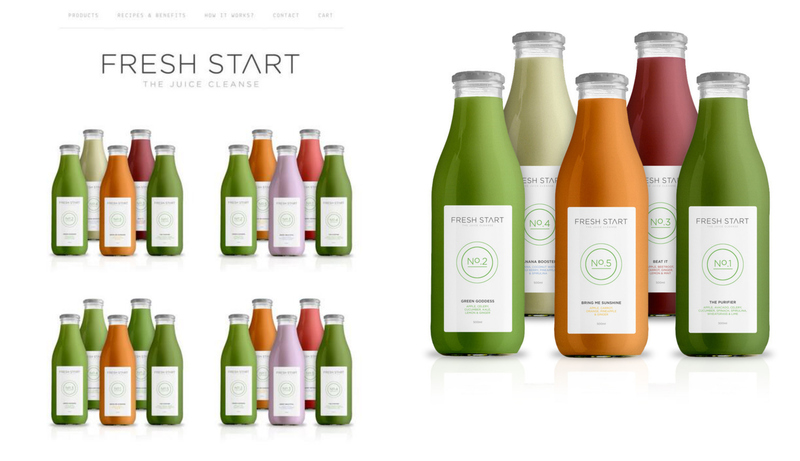 Fresh Start, established by Eve at the beginning of 2014, are an online company taking the hard work out of juicing by delivering juice cleanses straight to your door. 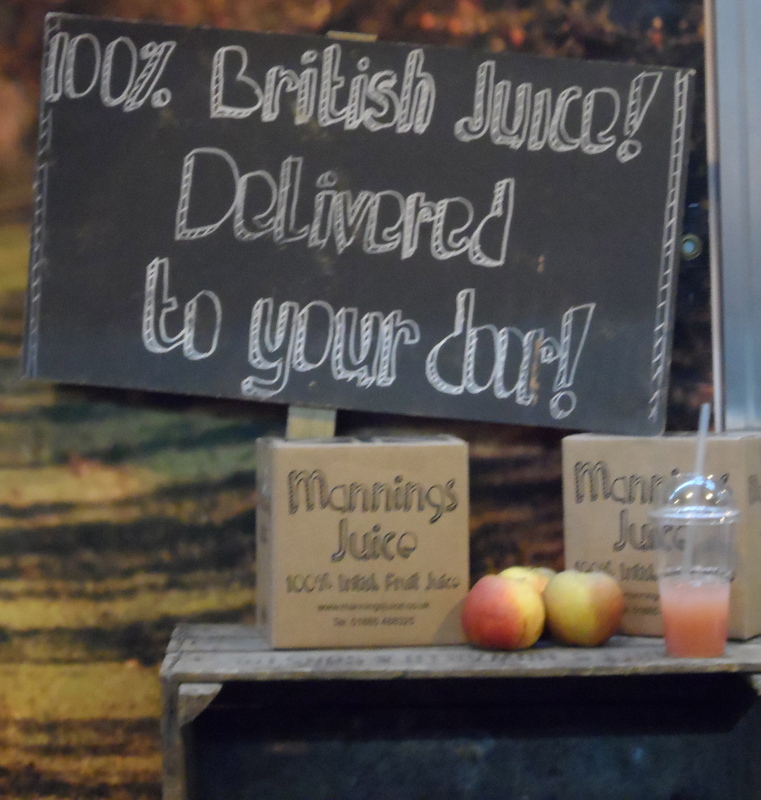 Although Fresh Start are currently only delivering to Cardiff and the surrounding areas, they’re hoping to make their fresh juices available for delivery to the rest of the UK very soon! Their juices are 100% natural, made from local produce and contain no added sugars or water, so are perfect for detoxing if you over-indulged over Christmas. Juicing is not only a convenient way to get more fruit and vegetables into your system, but has a whole host of reported benefits, including weight loss! Juicing is also said to be an easier way of absorbing nutrients than consuming fruit and vegetables in their whole form. Juices contain the calcium and iron found in fruit and vegetables, among other vitamins and minerals. For beauty lovers like myself, the ‘Get The Glow 3 Day Beauty Cleanse‘ is a great option and my favourite at £79.00. This juice blend is tailored to improve complexion or give a natural boost to a bride to be. Fresh Start currently offer a range of five juice cleanse programmes and you can even customise your cleanse to build a bespoke juicing package if you have specific requirements. 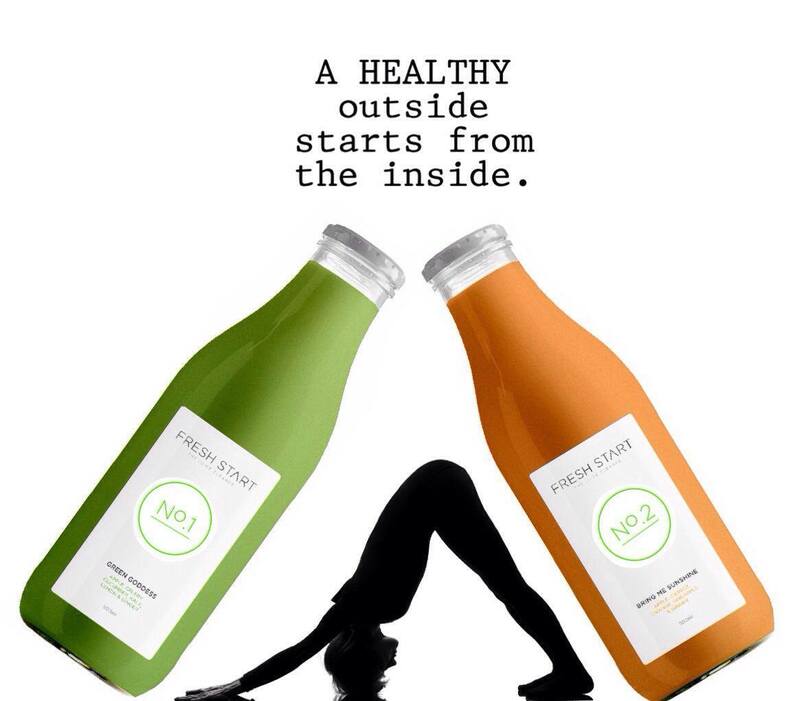 Their prices range from a one day juice cleanse for £29.00 to £109.00 for a 5 day juice cleanse supply. Free daily deliveries are available to all Cardiff postcodes. Cleanses can be booked from up to a month to 3 days in advance from when you wish to begin your juice cleanse. Fresh Start hope to be involved with events featuring juice demonstrations and tasters soon to spread the word of their juice cleanses through the local community and beyond. You can order their juice cleanses through their website at www.freshstartjuice.co.uk .You can also Tweet them @FreshStartJuice or visit the Fresh Start Facebook page. So if you live in or near Cardiff why not give them a try? If you’re based elsewhere in the UK, keep a look out for when Fresh Start juices are available to be delivered direct to you soon. Have you tried a juice cleanse before? 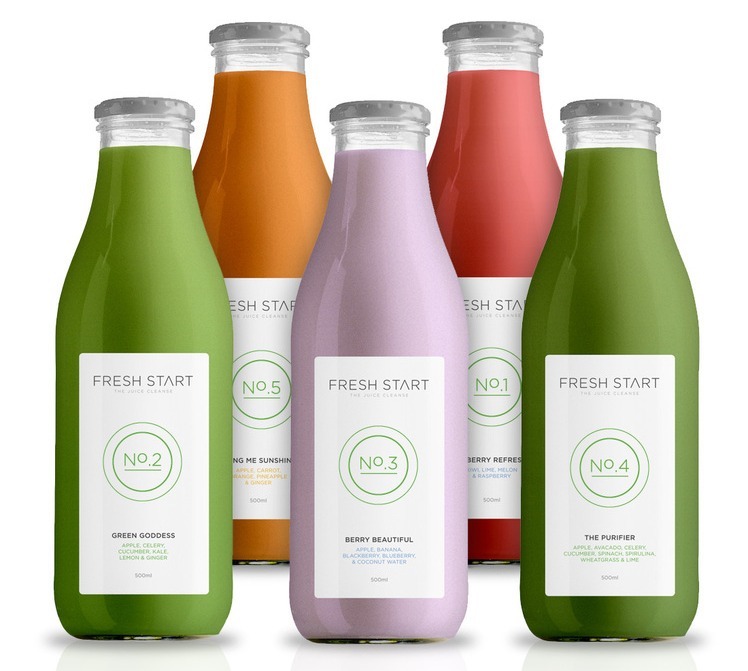 Are any of you Cardiff based lovelies thinking of giving Fresh Start juice cleanses a go? I was thrilled to be nominated by both Lottie from http://fallinginapassionpit.blogspot.co.uk and Lisa from http://lovefrom-lisa.blogspot.co.uk The Liebster Blogging Award! Fellow bloggers nominate their choice of bloggers from the blogging community for this award to recognise new blogs that are just beginning to build up their readership and show their future potential. 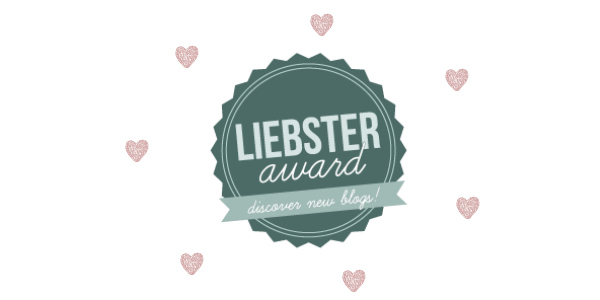 From reading Lisa’s post I know now that ‘Liebster’ means ‘love’ in German so I’m so pleased that both Lottie and Lisa enjoy my blog enough to nominate me for this! Thank you girls! 2) Answer the 11 questions set by the blogger who nominated you. 3) Nominate 11 bloggers of your choice whom have a small following at the moment but lots of potential for the future. 4) Include 11 questions for the bloggers you have nominated to answer. As I was lucky enough to be nominated by both Lottie and Lisa for the award, I’m going to answer both of their sets of questions in my post! So read on if you wan’t to know (way too many) facts about me! 1) What’s your biggest fear? 2) What’s your lifetime ambition? 3) Where do you see yourself in 5/10 years time? Hopefully, I will have my own home by then with a blue french bulldog wearing sky high Christian Louboutins and in a job that challenges me and that I enjoy! Extreme wishful thinking here again! Oooh hard one! Chocolate as being a vegetarian I can’t eat a lot of sweets out there anyway! Only more make-up than anyone could need if that counts! I hate coffee and love tea so that one is very easily answered! This question is now making me crave a cup of tea! My mum, soppy but true, she always deals with whatever life throws at her, good and bad and she’s always there to help and support me. 8) Do you prefer Summer or Winter? Summer- but not a British one, we never get much sun! 9) What’s one item of clothing you can’t live without? Is it extremely lazy if I say my onesie…? I have about five of these and to be honest, if I don’t need to leave the house, then I’m not getting out of my onesie ha! 10) Would you rather be famous, or the best friend of someone famous? Famous for doing something I was proud of! 11) What is something you are passionate about? Being a vegetarian and animal lover, animal rights are really important to me. 1) Do you have any New Year’s Resolutions? Yes mostly to be more organised- so I hope I can achieve this in 2014! 2) If you could travel to anywhere in the world where would you go? I’ve always wanted to go on Safari so I would love to travel to Africa and experience a full safari there! High-end, if I could afford it! But realistically, on a student budget, high-street! 4) What is your favourite make-up brand? 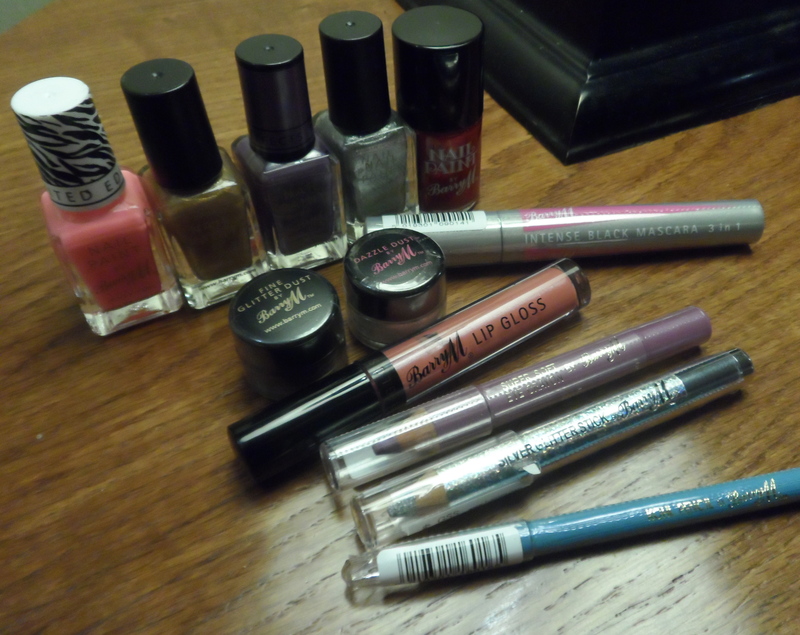 Urban Decay- I think their products are beautiful and worth the slightly higher price tag! I started this blog as part of one of my modules for my University master’s degree but I absolutely love blogging now so I can’t wait to continue to grow my blog- hopefully for years to come! 6) What are you most excited about for 2014? Trying to be more organised in life (not very exciting I know) and hopefully graduating from my master’s degree. 7) If you won the lottery what is the first thing you would buy? 8) What is your favourite online clothing brand? It depends on the weather, but I would go with a skirt! 10) What is your favourite city in the world? I’m going to stay true to my Welsh roots and say Cardiff. 11) What beauty product could you not live without? The Urban Decay Naked Palette, I’m too obsessed with it! 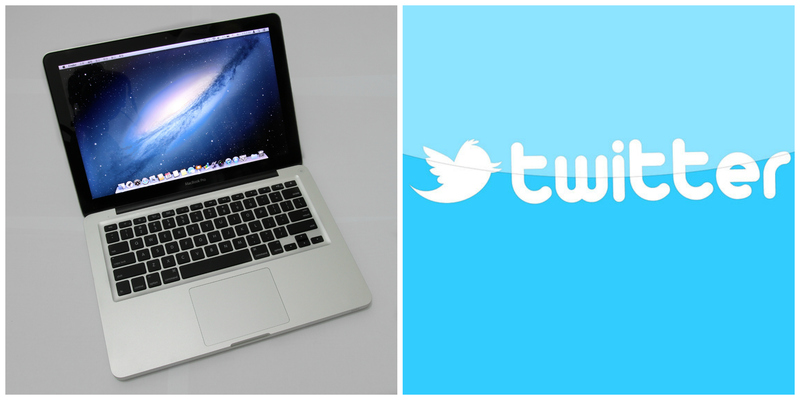 11 Questions For My Nominated Bloggers To Answer! 2) What is your favourite book and why? 5) What’s the best thing that’s happened to you so far in 2014? 6) Yes or no to wearing black lipstick (not at Halloween)? 7) What’s your favourite mascara and why? 8) What is your dream job and how do you think you could get there? 9) What beauty product are you currently lusting after? 10) Harry Potter or Lord Of The Rings? I hope you enjoyed this post and I’d love to read your answers to any of the Liebster questions above in the comments! We all share a passion for displaying our thoughts and opinions on a wide array of subjects and providing honest and useful content for our readers, whom very often are bloggers themselves. While there are thousands of blogs and bloggers out there, the blogging world still feels very intimate. I can’t underestimate the excitement of seeing a new comment on a blog post I worked so hard on, or the value gained from the new follower on Twitter who you can swap blog links with. I know many bloggers will feel the same. Having your own small space of the internet to share your creativity, broadcast the thoughts that overrun in your head and project your passion for words and photography really is so special and something we should enjoy cultivating with our readers and fellow bloggers. By appreciating and helping one another, we can all reach our blogging hopes and dreams that much quicker. With this in mind if you’re a blogger like me or a reader of my blog, (thank you!) I would like to share (in no particular order) just some of my favourite beauty and lifestyle blogs of last year and the content they worked so hard on. I recently discovered Rebecca’s lovely blog, Autumn Leaves and I’m so glad I did. It has everything you want in a beauty blog- beautiful clear photos, in-depth reviews of products you have been desperate to try and a mix of high-end and more affordable beauty buys to suit all her readers.Her best of 2013 posts are a must read to show you the beauty gems of last year and her lifestyle posts are so well researched and useful. Some of my favourite posts of Rebecca’s include her advice for beauty bloggers which I am personally using to help me develop my blog: http://bit.ly/1bGq4CL and her amazingly detailed post about moving out which offers such good advice for someone taking that big step: http://bit.ly/1lGZajB. She Might Be Loved is a beauty blog run by the fabulous Georgina and always manages to get the similarly named Maroon 5 song stuck in my head every time I have a read! 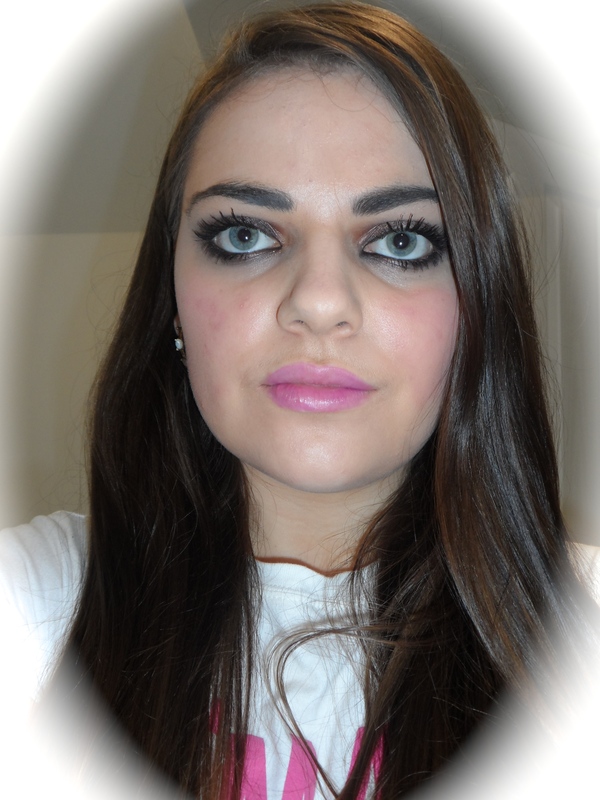 Georgina’s make-up looks are truly amazing and she really is so talented with the make-up brushes! Her beauty tutorials show you how to create her dramatic and flawless makeup looks and her Halloween looks were also nothing short of incredible! Georgina works at beauty blogger’s favourite Lush so you also see some lovely posts and an insider’s view of their smellies and latest bath collections! Back to her blog, Chelsea uses her gorgeously girly platform to post her beautiful outfits to give us all some style inspiration, and lots of make-up reviews, with a particular fondness for Mac lipstick posts! After writing my contribution in a colab with lots of other beauty bloggers on Michelle’s blog, Thou Shalt Not Covet on our most wished for Christmas beauty product, (http://bit.ly/1cwXSCo) Michelle’s blog became a regular read of mine. 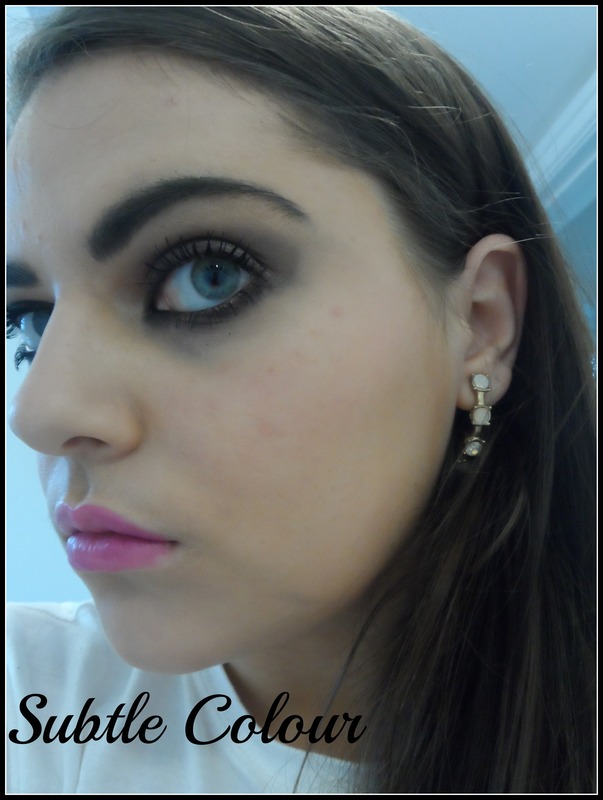 I love her mixture of outfit and jewellery posts and her detailed make-up reviews always feature great swatches. Seeing a glimpse into Michelle’s beautiful family life is lovely and as a newbie blogger, I’m especially looking forward to reading her ‘Blogging for Beginners’ series which is starting soon! While the blogs I’ve mentioned above are all UK based beauty blogs, I also really enjoying reading the thoughts of beauty bloggers from across the globe. One of my favourites is American beauty blog Josephine Nycole. I hope you enjoyed reading about some of my favourite blogs of 2013 and will enjoy checking out the blogs I love just as much as me. What are your favourite beauty blogs? I hope you all had a lovely Christmas and are looking forward to what 2014 may bring for you! I thought I would just do a quick post to thank everyone who read and (hopefully) enjoyed my blog in 2013 and share my 2014 beauty resolutions with you! 1) Take better care of my skin. I have to admit I’m rather lazy when it comes to skincare and having spot prone skin, I should probably spend a bit longer ensuring I remove all traces of make-up from my face and moisturise daily. 2) Try some more adventurous lip colours. I love lip products, probably too much… but I would like to step out of my comfort zone with the colours next year and try out some brighter shades. 3) Eat healthier. This might not seem like an obvious beauty resolution but I definitely subscribe to the notion that we ‘are what we eat.’ I hope by eating a healthier diet, I can improve the appearance of my skin, hair and nails and not just my waistline! You can read my post on the importance of healthy eating ft. an interview with Marco Pierre White himself here: http://bit.ly/1a8uEQj. 5) Organise my make-up. I am probably the untidiest person you could ever meet but I’m hoping to change this in 2014 by sorting through my bedroom- my makeup organisation is at the top of my ‘to do’ list! 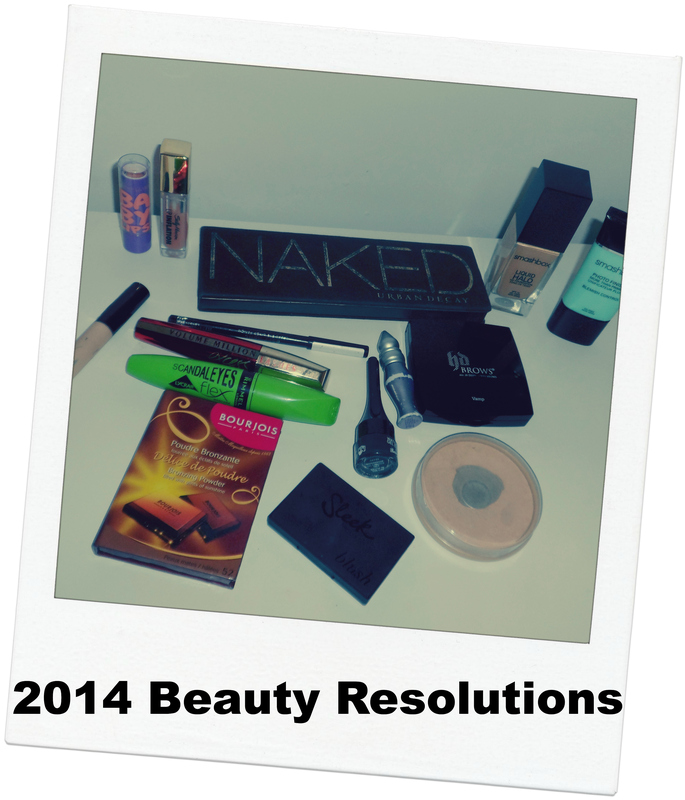 What are your beauty resolutions for 2014? I would love to hear them in the comments section! 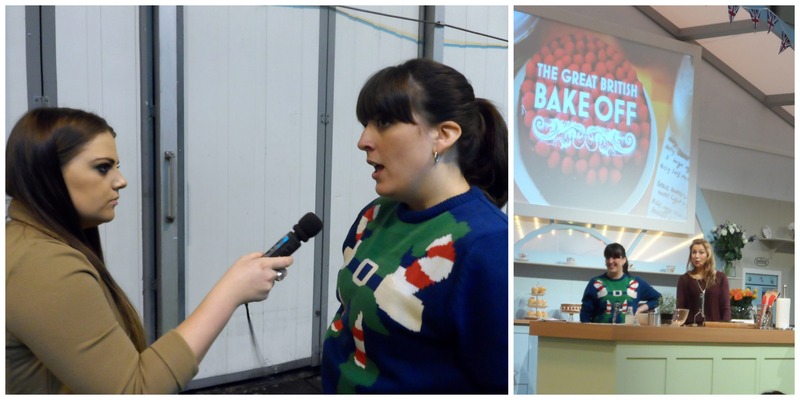 As well as having a fantastic, shopping-filled day at The Clothes Show Live 2013, (see my thoughts on the day here: http://wp.me/p42P0z-6b) Alice In The Looking Glass Blog was lucky enough to speak to some of the many celebrities attending the show! Armed with my trusty mike ready to do some interviews! Listen to my interviews with The Only Way Is Essex (TOWIE) star Sam Faiers, X Factor alumni Sam Callahan and Made In Chelsea’s Jamie Laing below! After she had met her seemingly endless queue of fans for her signing with gorgeous swimwear brand South Beach, I chatted with Sam Faiers, star of The Only Way Is Essex ! She told us more about her day, South Beach and how her pop-up shop was going for her brand Minnies Boutique which she owns alongside her sister and fellow TOWIE star Billie Faiers ! 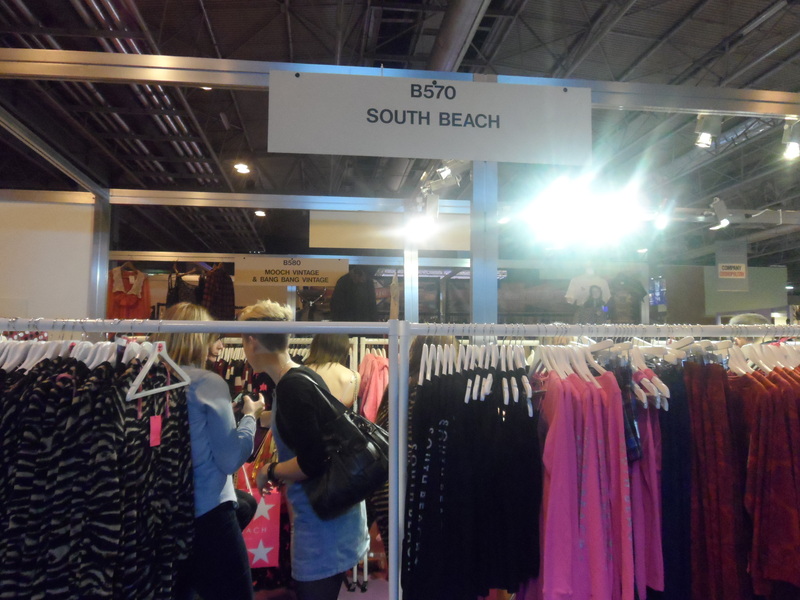 The South Beach Stand at The Clothes Show Live. Sam was at the Clothes Show to promote celebrity favourite South Beach . South Beach are a new, on-trend swim and beachwear brand that launched this spring. Their pool-side designs are unique and eye-catching and they have also launched an amazing loungewear range to cozy up in this winter! One of their super-soft onesies is definitely on my Christmas list! South Beach have recently started an incredible sale with many of their beautiful designs at up to 70% off! 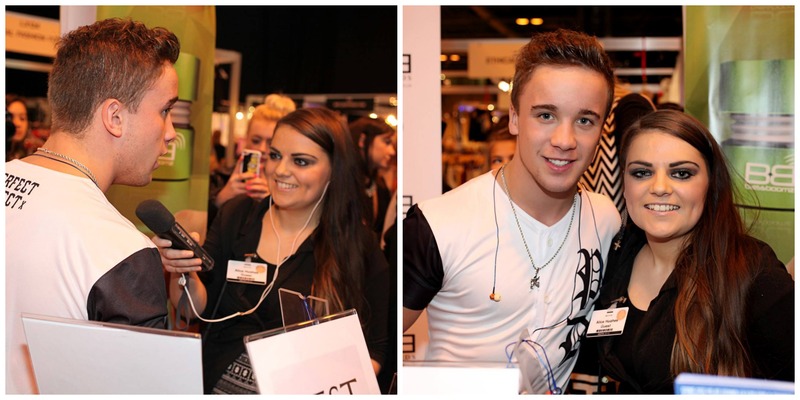 Former X Factor contestant Sam Callahan also spoke to me about meeting his hordes of ‘Callafans’, his new album and promoting stylish, high performance headphones brand BassBuds at The Clothes Show. With The lovely Sam Callahan! Photos by the talented Sara Callow Photography. Everyone’s favourite Chelsea Boi Jamie Laing was at the Clothes Show promoting his young, fun (and very pink) brand Candy Kittens. Candy Kittens is basically a sweet shop meets fashion boutique, with added Chelsea charm. Featuring fashion collections for both ‘girls and guys’ and Willy Wonka esque lollipops, Candy Kittens is the perfect place to buy gifts for your Chelsea loving friends! 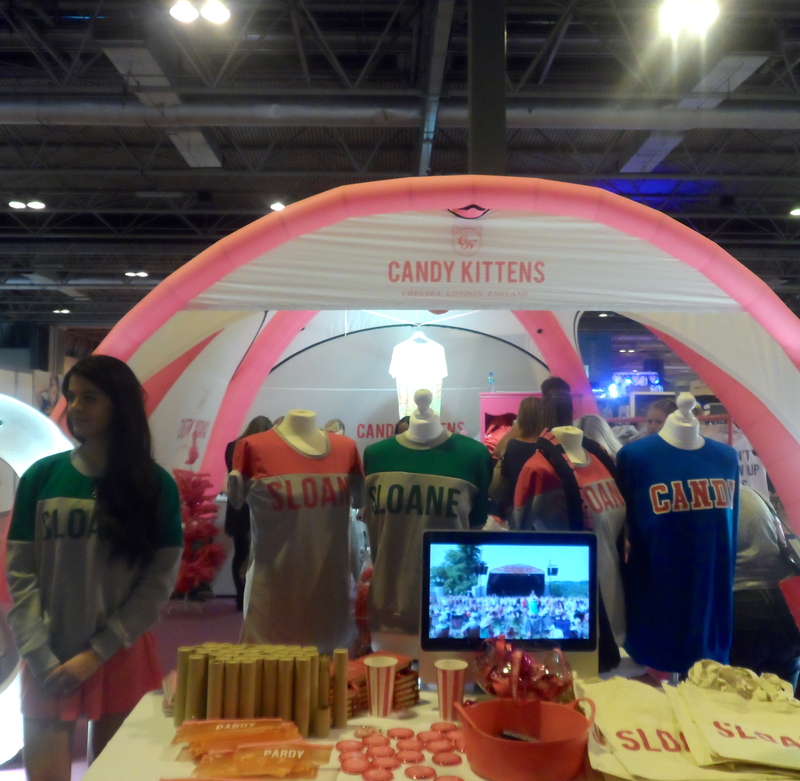 The Candy Kittens Stall At The Clothes Show. I bumped into TOWIE star, the lovely Gemma Collins who was promoting her plus-size clothing range, The Gemma Collins Collection and spotted former TOWIE cast member Amy Childs on the stall for her fashion range! Gemma Collins and Amy Childs! I also spoke to some of the exhibitors at the Clothes Show about the exciting products they had for sale! Confectionery king Jelly Belly UK were another crowded stand at the Clothes Show. With their trademark jelly beans and a whole host of Jelly Belly themed products on offer, customers had plenty of choices to satisfy their sweet tooth! The world’s most famous jelly bean may be renowned for its varied and exciting flavours, but are you brave enough to try their latest addition…? I hope you enjoyed listening to my interviews and I’d love you to comment below with your style tips! Clothes Show Live at the NEC Birmingham. I consider 7am far too early for any self-respecting person to rise on a Sunday morning, but the first week of December saw my doing just that. One coach that failed to stop, a taxi, a short train ride and a two hour drive later, I had arrived at The Clothes Show Live 2013 with my mum and sister in tow! After being subjected to the £10.00 car-parking fee (a bit steep considering we had paid thirty pounds each for a ticket), we hopped on the free bus provided to arrive at the entrance to the venue, The NEC in Birmingham. One Of The Shows On The Day. 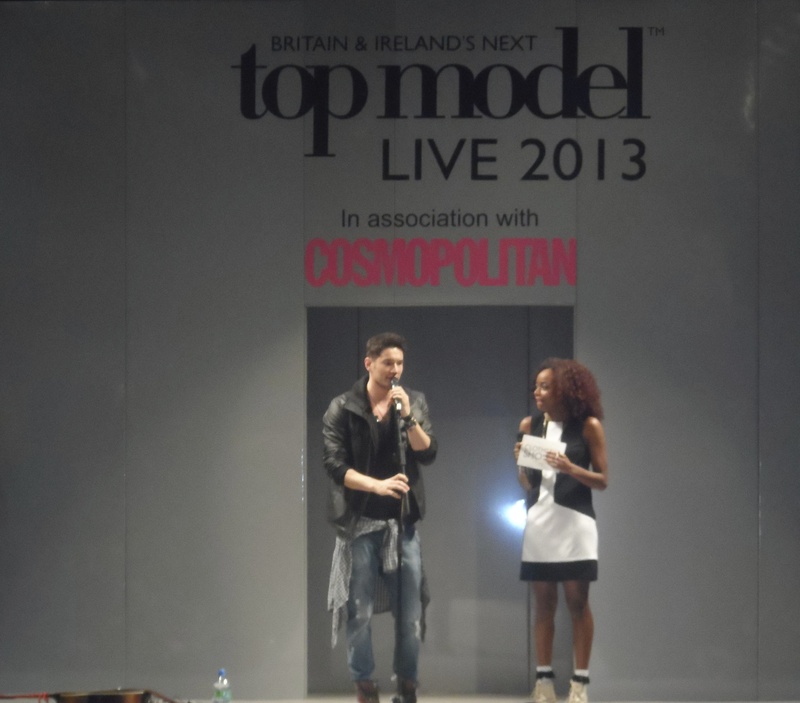 My Top Five Clothes Show Tips! I composed a short list of my tips on how to make the most of your day if you’re planning on attending the show next year. 1) Wear Flat Shoes! -With a seemingly endless arena to get around and plenty of shopping to be done, comfortable, flat shoes are a must for you to make the most of your day! 2) Bring your own food! -This will save you money on the limited and expensive food options I saw on offer at the show. Further, having a packed-lunch you can easily eat while walking around will mean you don’t waste precious shopping time queuing for food! Also, note that the choices available for specialist dietary requirements were very limited. 3) Bring the cash you are planning to spend with you! -There’s limited cash-points available at the show and the cash-machines there often have long queues and charge you for the withdrawal. Bringing the money you wsant to spend rather than putting it on the plastic also means you will think more about what you’re spending and are less likely to overspend! 4) Take a camera or phone to take photographs with! -There’s plenty of opportunities to get snapped with your favourite celeb at the show so you you can get that perfect shot at one of the organised meet and greet sessions! 5) Arrange a meeting place with your companions! -The Show covers a massive area and it’s so easy to get separated from your friends while you’re all browsing at different stalls. I found the mobile phone signal to be surprisingly bad inside so it’s possible you may not be able to contact your companions if you lose sight of them. Arranging a central place to meet if you can’t find each other means you can split up without worrying where everyone is! I have to admit, I was pretty disappointed with the clothes and accessories for sale, as being at The Clothes Show, I would have expected the offerings to be a bit more…well fashionable. The clothes stalls had a mostly market- place kind of vibe as a lot of what was on offer looked a bit cheap and un-original and many of the stands seemed to be selling the same things. – Cosmopolitan and Company Magazine Goody Bag. 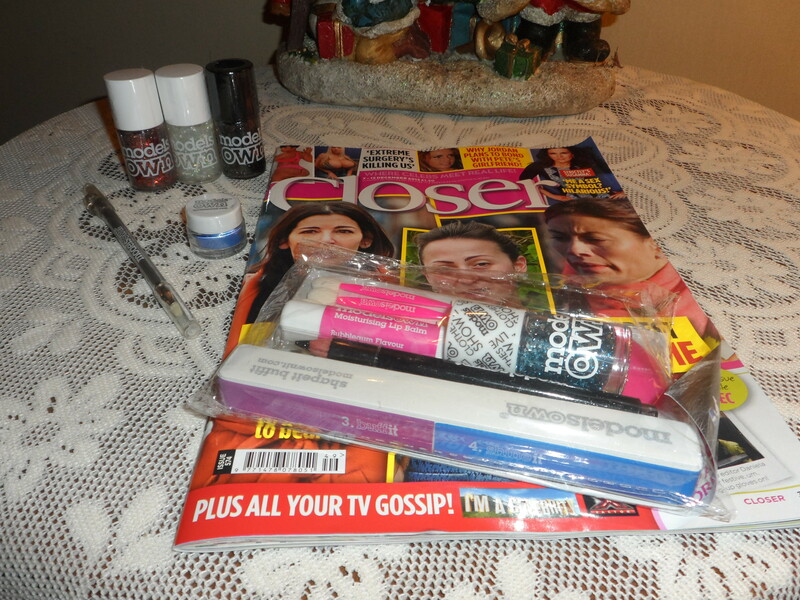 My Goody Bag from Cosmopolitan and Company Magazine. Having paid my £3.00 for this goody bag in advance when I bought my Clothes Show tickets, I was very excited to pick this up on the day! I was however, really disappointed with what was included. The Contents of The Cosmopolitan and Company Magazine Goody Bag. So included in the goody bag was: The December issues of Cosmopolitan and Company Magazines and a Men’s Health Christmas 2013 Gift Guide for Him, a rather bizarre tasting lemon and mint drink (which I drank at the show), a mini Andrex Toilet Tissue, two sachets of Kenco Millicano Instant Coffee, one Lindt Lindor Chocolate, a sachet of James Bond 007 Quantum Aftershave, a small tube of Colgate Max White One Toothpaste and a mini Rimmel Stay Matte Foundation. 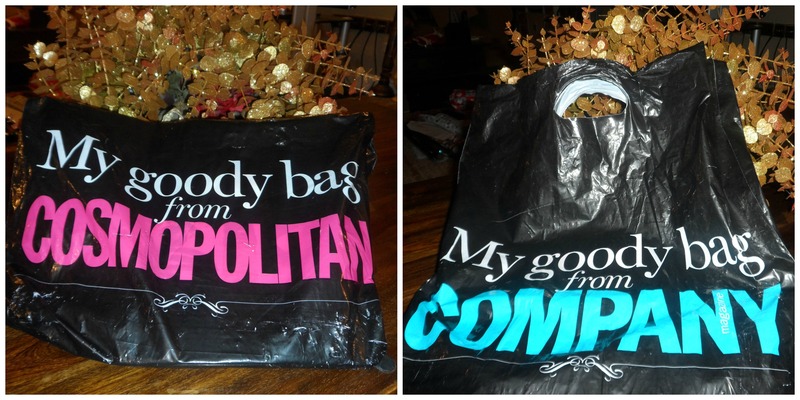 Although in terms of value for money the goody bag was worth buying as Cosmopolitan and Company Magazine together retail for well over £3.00, I was expecting more from my favourite magazines. I was certainly surprised to see toilet paper included and a sample of men’s aftershave was also a strange choice for a goody bag from a women’s magazine. The best picks from the bag were the mini toothpaste and foundation– although the foundation was perhaps a poor choice as the colour ‘Ivory’ included would only suit some of their reader’s skin tones. All in all, I think this was a poor effort for a ‘goody bag’ and the magazines were the only inclusion I will actually enjoy. The Goody Bag from Barry M.
There were slightly different products included in the goody bags but I was really pleased with the selection I received. My bag held an intense black mascara, a lipgloss, several eye-pencils, two dazzle-dusts and a selection of their infamous nail paints. The nail polishes alone retail for £2.99 each so this bag of treats was a real bargain! 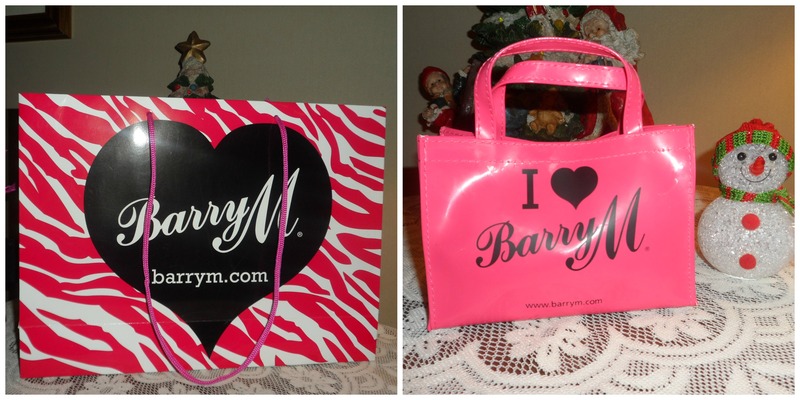 Barry M is one of my favourite beauty brands so I can’t wait to try out all the products in my bag! Models Own Goody Bag Contents. The Models Own goody bag was another great £10.00 buy at the show! There were rows upon rows of nail polish colours to choose from and you could choose any three you liked to go with your free gifts. I chose red, white and black glitter polishes for the Christmas season and received a goody bag with them including a copy of Closer Magazine, a bubblegum flavour lip-balm, eye-shadow applicators, four eye-pencils, a purple powder eye-shadow, a nail file and buffer, a pocket mirror and the official Models Own Clothes Show nail polish. This was my favourite buy from the show as not only were you able to pick which three polishes you wanted, but the goody bag contents were absolutely amazing for the mere price of £10.00! Jelly Pong Pong Beauty Bags. Jelly Pong Pong Beauty Bags Contents. Jelly Pong Pong isn’t a brand I’ve tried before so I can’t wait to sample the products included in my beauty bags! I love the quirky name of the brand and the packaging on the products is pretty and colourful. Included in my beauty bags was a bronzer duo, an illuminating palette , a 2 in 1 eye-pencil and eye-shadow and a lip and cheek stain. Best of all, it was only £5.00 for two goody bags which was certainly too good to miss! My Pink Sleep In Rollers! I’ve wanted to try Sleep In Rollers for a long time so I was really excited to see them for sale at the show. This set was just £10.00 and included the gorgeous pink glitter rollers set, a velour pouch with kirby grips, an instructional DVD and two reusable bags! The exact same set is on the Sleep In Rollers website for £29.99 so I’m really pleased with my buy! I’m planning on doing a review post when I try out these rollers so I hope they meet my high expectations! Oh My Love Top And Skirt. Although I wasn’t overly impressed with most of the clothes stalls, I did spot this gorgeous, glittery top and matching skirt on the Oh My Love Stand! At just £20 for the set, I think this sparkly outfit is perfect for the festive season and I love that I can wear it together and as separates! Did you go to the Clothes Show this year or are you planning on attending next year? I’d love to know your thoughts in the comments! Healthy eating. It’s seemingly the ‘buzz word’ of the moment and a phrase we’re all too used to hearing. Eat your five a day, consume more fibre, stop eating sugary foods… But why should we listen to this advice and ditch the cakes for carrots? What health benefits can we derive from the food we choose to eat? I looked at what we need in our diets to lead a healthy lifestyle and why eating healthily is an important choice. What nutrients do we need for a healthy diet and why? – Vitamins and Minerals: Vitamin A, Vitamin B, C, D, E and K are all essential nutrients needed in our diets. 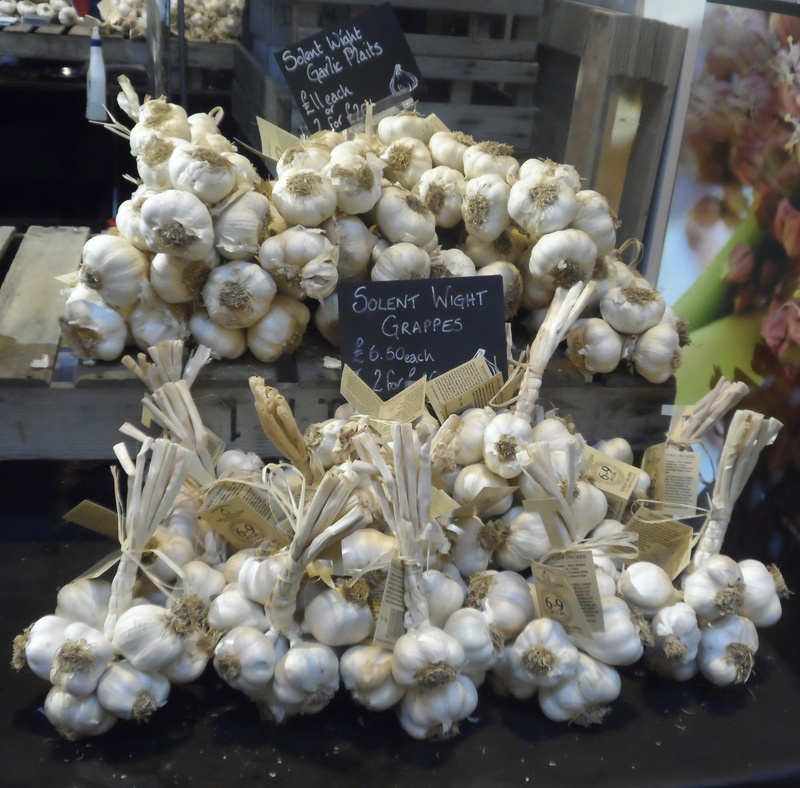 – We should aim to consume vitamin filled foods such as Garlic which is rich in both vitamins B6 and vitamin C.
– Folic Acid- This is an especially important nutrient for pregnant women. Folic acid combines with vitamin B12 to create healthy blood cells and aids in reducing central nervous birth defects. It is found in many foods including broccoli and spinach. – Calcium- This is essential for the development of strong teeth and bones, the regulation of muscle contractions and maintaining normal blood clot functioning. Dairy products and green leafy vegetables are rich in calcium. – Iron- Iron is utilised to create red blood cells which then carry oxygen through the body. Foods containing iron include dried fruit and the majority of dark green leafy vegetables. – Fibre- Having fibre in our diets is important to reduce your risk of heart disease, diabetes and certain cancers. It also plays a key role in improving digestive function. Foods containing fibre include wholemeal bread and fruits like bananas and prunes. – A limited Fat allowance, Protein and Carbohydrates are also essential components of a balanced diet. What food groups should we include in our diet? According to the NHS, people should aim to eat a balanced diet containing a mix of all food groups. – Limited amounts of high-fat and high-sugar foods. 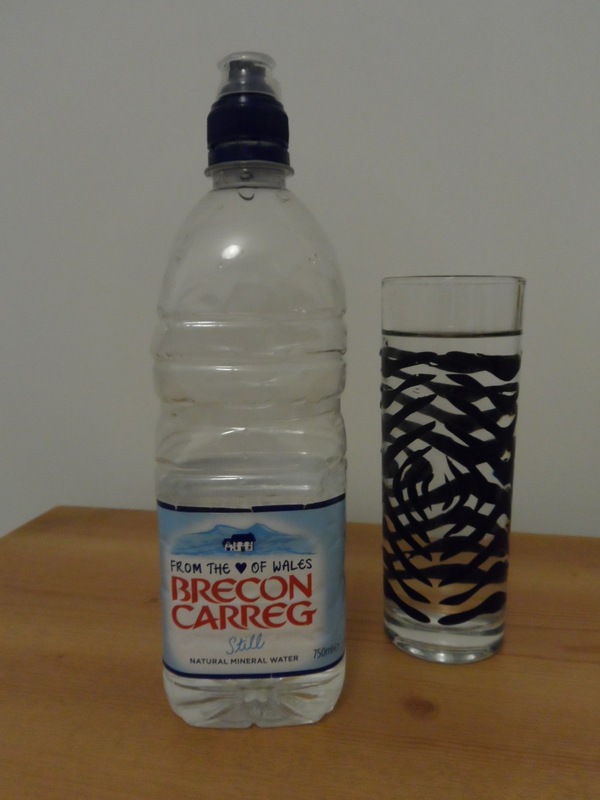 – Additionally, following the advice of The European Food Safety Authority, women should drink eight 200ml glasses of water per day while men should drink ten to avoid experiencing dehydration. The most obvious negative impact of an unhealthy diet is weight gain. In fact, the Welsh Health Survey of 2012 indicated that more than half of adults in Wales were either overweight or obese. The British Heart Foundation has also warned that if current obesity patterns continue, almost fifty percent of British people will be labelled as obese by the year 2030. The NHS state that being overweight increases your likelihood of suffering from type 2 diabetes, heart disease and particular cancers including breast cancer. Eating healthy food is therefore claimed to be essential not only to maintain a healthy weight but to consequently reduce your risk of developing life-threatening diseases. 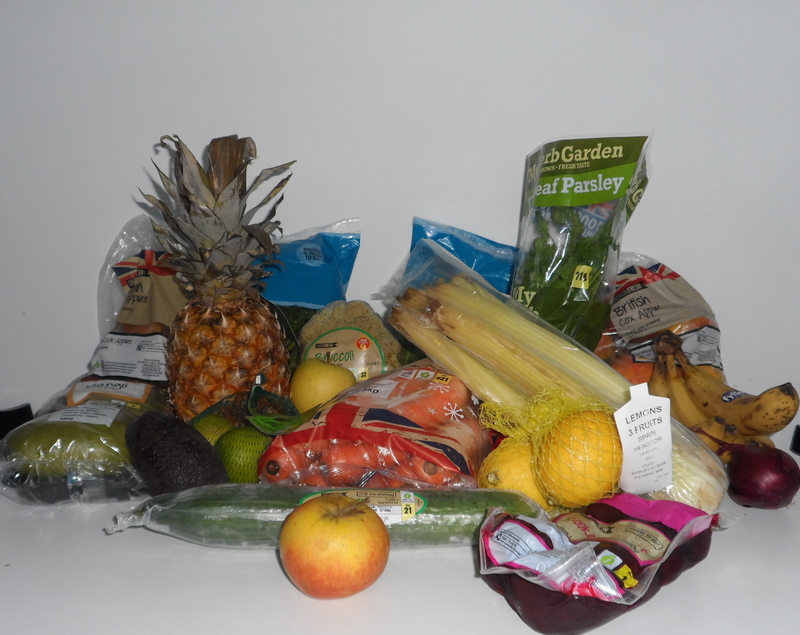 Eating the recommended five portions of fruit and vegetables a day is also important for our physical health following information issued by The Department of Health. Their studies have shown that eating more fruit and vegetables can markedly lessen the risk of several chronic diseases. Further, the antioxidants produced by these foods can help to stop damage to tissues which could lead to cardiovascular disease and certain cancers. A quick and easy way to consume more fruit and vegetables is by juicing. The Mental Health Foundation point to growing evidence which shows that our mental wellbeing can be influenced by what we eat. Research has indicated that people reporting daily mental health concerns are less likely to consume fruit or fruit juices than those who do not report problems. Foods high in sugar may be released into the bloodstream quickly and cause an initial energy ‘high’ that will not have a long-lasting effect. This can negatively impact on energy levels and general mood. Fruit and vegetables and wholegrain foods are better choices to maintain mental well-being as they raise blood sugar slowly and the vitamin B1 they contain has been considered to have positive effects on mood. Mental health charity, Mind also note how excessive caffeine in our diets can lead to signs of anxiety, nervousness and depression. On the other hand, drinking water and consuming your five a day of fruit and vegetables can provide essential nutrients to aid mental wellbeing. Are People More Concerned About Their Health Now? So healthy eating is arguably important both for the health of our bodies and our minds. It seems the well known phrase “You are what you eat” may well be true.